Directions (1 - 5): Study the following information carefully and answer the given questions. A and C started a business. After 5 months, A invested Rs. 4000 more and at the same time G enter into a business by investing Rs. 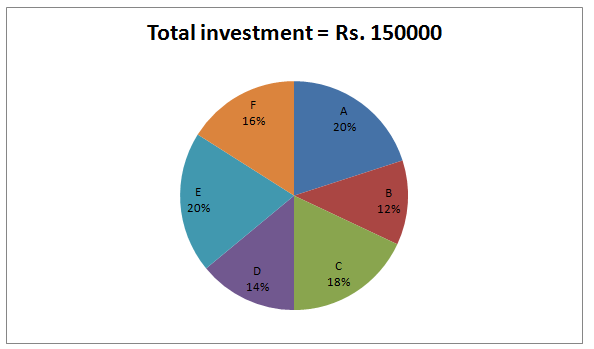 5000 more than the investment of C. Find the share of G, if the total share of A and C together is Rs. 103240? B and D together started a business. After 6 months, B left the business and at the same time E enters into a business. D left the business after 2 months of B left the business. E invested the amount for x months only. Out of the total profit of Rs. 72000 for the certain period, D received the share of Rs. 21000. Find the value of x? B, F and N together started a business by investing in the ratio of 3: 4 : 6. After 7 months, N is replaced by D. And after another 2 months, B invested Rs. 6000 more. Find the total profit at the end of the year, if the share of B and D together is Rs. 113000? B, E and F started a business. B is a working partner but E and F are sleeping partner in the business. For managing the business, B received 10% of the total profit. Find the difference between the share of B and F, if the total profit at the end of the year is Rs. 78000? C, D and E together started a business. After 4 months, C withdraw one-third of the initial investment and after another 2 months, E withdraw one-sixth of the initial investment. Find the share of E, if the total profit at the end of the year is Rs. 139000? 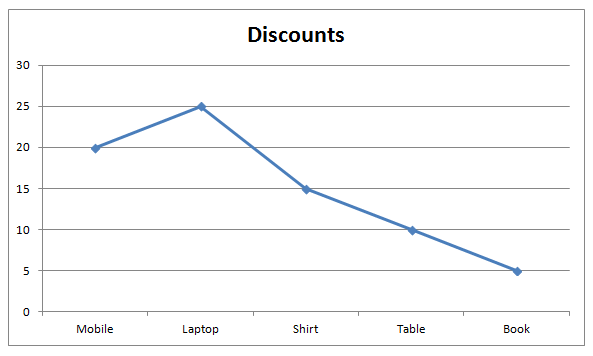 The given line graph shows the discount percent of five different items-Mobile, Laptop, Shirt, Table and Book. Mani buys a washing machine with a marked price of Rs.14000 at a certain discount. He also buys a table, having a marked price of Rs.500. He gains an extra 8% discount on the total purchase price of washing machine and table. If he ended up paying Rs.12000, then what was the approximate discount on the washing machine? If Shon went to shop and purchased mobile and laptop. Marked price of mobile is Rs. 4500 and the cost price of the laptop is Rs.10000. If shopkeeper marked both the items 20% above the cost price, then what is the overall approximate percent profit or loss of Shon in this transaction? Marked price of the shirt is Rs.480. Shopkeeper mistakenly calculated the discount twice and still makes a profit of 20%. Find the approximate profit that would have been earned by the shopkeeper if he had calculated the discount once? If the marked up price of Book is 50% above the cost price of the book. Total amount of discount offered on Book is Rs.150 and the profit of book is Rs.850. If the shopkeeper interchanges the marked up percent and discount percent offered on book, then what is the difference between original selling price and new selling price of Book? A retailer bought a mobile. He sold the mobile to the customer for Rs.26000 and earned a profit of 30% of his cost price. What was the initial marked price of the mobile? 1) A and C started a business. After 5 months, A invested Rs. 4000 more and at the same time G enter into a business by investing Rs. 5000 more than the investment of C. Find the share of G, if the total share of A and C together is Rs. 103240? 2) B and D together started a business. After 6 months, B left the business and at the same time E enters into a business. D left the business after 2 months of B left the business. E invested the amount for x months only. Out of the total profit of Rs. 72000 for the certain period, D received the share of Rs. 21000. Find the value of x? 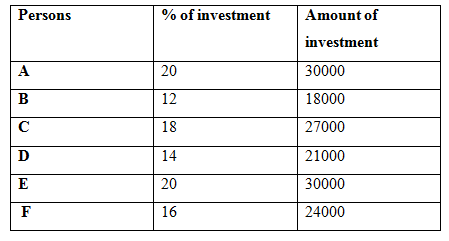 3) B, F and N together started a business by investing in the ratio of 3: 4 : 6. After 7 months, N is replaced by D. And after another 2 months, B invested Rs. 6000 more. Find the total profit at the end of the year, if the share of B and D together is Rs. 113000? 4) B, E and F started a business. B is a working partner but E and F are sleeping partner in the business. For managing the business, B received 10% of the total profit. Find the difference between the share of B and F, if the total profit at the end of the year is Rs. 78000? 5) C, D and E together started a business. After 4 months, C withdraw one-third of the initial investment and after another 2 months, E withdraw one-sixth of the initial investment. Find the share of E, if the total profit at the end of the year is Rs. 139000? 6) Mani buys a washing machine with a marked price of Rs.14000 at a certain discount. He also buys a table, having a marked price of Rs.500. He gains an extra 8% discount on the total purchase price of washing machine and table. If he ended up paying Rs.12000, then what was the approximate discount on the washing machine? 7) If Shon went to shop and purchased mobile and laptop. Marked price of mobile is Rs. 4500 and the cost price of the laptop is Rs.10000. If shopkeeper marked both the items 20% above the cost price, then what is the overall approximate percent profit or loss of Shon in this transaction? 8) Marked price of the shirt is Rs.480. Shopkeeper mistakenly calculated the discount twice and still makes a profit of 20%. Find the approximate profit that would have been earned by the shopkeeper if he had calculated the discount once? 9) If the marked up price of Book is 50% above the cost price of the book. Total amount of discount offered on Book is Rs.150 and the profit of book is Rs.850. If the shopkeeper interchanges the marked up percent and discount percent offered on book, then what is the difference between original selling price and new selling price of Book? 10) A retailer bought a mobile. He sold the mobile to the customer for Rs.26000 and earned a profit of 30% of his cost price. What was the initial marked price of the mobile?